I remember our first basic obedience class with our dog Shadow. What a night that was. I went home thinking that there is no way that we can train this dog. Then after talking to Kari I realized I am the one who had to be more firm on him. I had to have the confidence to train him. We kept going to class and worked on him at home. On the rainy days we practiced in the house. Whenever I had a question or started to doubt myself all I had to do was reach out to Kari and Eve and I got right back on track. Now Shadow can do mostly everything that he learned in class on his own. Now he listens when I speak to him. We are starting with silent hand signals. Thank you Kari for being such a wonderful trainer. You helped us to be better dog owners. You are awesome! Look out Red Deer here comes THE best daycare in town! One that cares about the well being of your dogs, one that's willing to work with you to get mans best friend well balanced and happy! I'm incredibly excited for Karing Homes. I just know that they are going to be incredibly successful! Thank you, Karing Homes, from a fellow dog enthusiast! My dog went to daycare yesterday. She had a fun day socializing with other dogs. Last night she was so tired, she spent the whole night sleeping on her dog bed. These ladies are the best, they have been karing (lol) for my 2 great danes since they where just babies. They can handle any thing, I mean any thing, like a great dane pooing in the car to a great dane pooing in the bed of one of them while she was in it! They have always done a great job for me I always know I dont have to call and check in or worry at all and thats hard for me to do as I know it is for all of us that love your furry babies. We have an Italian Greyhound, and with the way the weather has been she has not been able to wear off her energy. She has been going to Karing Holmes Doggie Daycare, and when she comes home she is tuckered right out! She is starting to open up and learning to socialize with other dogs besides her own pack at home. It is a great place to take your friend I don't worry about her and I know she will take excellent care of our Dog! Thanks Karing Holmes you will see lots of Zena! When I need to travel out of town I feel 100% comfortable leaving my dog Sugar with Kari. Now that she has the daycare I am thrilled; my dog's behavior has improved and she is able to walk on the treadmill too! That's quite an accomplishment for her. 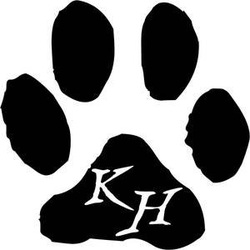 Thank you Karing Holmes for providing a "home away from home" for Sugar. I just wanted to thank you (Gloria) once again for all your help with Diamond.. I think she truly is a better dog now and I have the proper tools to continue working with her to see the improvement even more! You have given us the confidence now that she isn't such a bad and aggressive dog like i kinda thought she was... I know she has more learning to do but happy for what we have now and look forward to seeing how the daycare setting works for her and how it will help her change too! I will not hesitate to sign up for another class with Gloria if need be in the future with Diamond or when I get another dog... Thanks again!! Just wanted to now say that Daycare has been going great for Diamond!! She is opening up to socializing again which I am soo proud of and I am sure loves the company there and KENDRA! Gives her a break from sitting on her chair all day during the week while I am at work bored and lonely at times.. Pack walks are just awesome, treadmill work is good and love the agility idea as mine is a Red Heeler and still energetic in her older age! I just cant say enough about this place! We needed this a loooong time ago!! Keep it going Kari and team !! How can I begin! My lab/chow cross and basset/beagle cross are not only in LOVE with Kari and Tara, but have become totally different dogs these past 2 months since going to daycare. My skittish, crazy lab hadn't had his nails cut in 3 years because of his fear and the girls were able to do it almost immediately! Not only that, but in social settings both of my boys no longer charge at other dogs...they just sniff and poke around, like a balanced dog should. I couldn't be happier with their socialization progress! They even leave me to join their daycare friends without looking back. It truly makes me happy to know they are in such good care. First off I need to update everyone...we are now taking all 4 of our dogs to daycare Zena our Italian Greyhound, Miya our shitzu Maltese, Pietrie our Deerhead Chihuahua, and Chiquita our Teacup Applehead Chihuahua...they all LOVE it there Pietrie was shy and untrusting when she first went there, and now she can hardly wait for the gate to open so she can join the rest of the dogs! What a difference it has made for her and I am so grateful :-) they say a balanced dog is a happy dog and each day I see her smiling more. The rest of the dogs well they are balancing out too. They know when their coat goes on they are heading to their second family and it is the next best thing to home! Thank You Kari and Tara, and all the volunteers who take such "great" care of our four legged kids! We would not take them any where else! If you would like to send in comments or testimonials to add to our site, please send them in here.